This Sunday, millions of children will be on the hunt for Easter eggs. While Easter eggs are associated with Christianity, the egg as a symbol of spring is found in cultures around the world and has been associated with renewed life for thousands of years. One of the first written references of an egg that we have is from an Egyptian papyrus that most likely recounts Thoth, an early deity designated by his cult following as a creator god, hatching the world from an egg. At the Egyptian city of Hermopolis, the priests claimed that part of the “world egg” was buried there and it is from the egg that the earth, sun, and creatures came. The Chandogya Upanishad and ancient Sanskrit text written ca. 800 BCE, tells of the Earth being created with the cracking open of an egg. One half of the shell became the silver moon, and the other the golden sun. 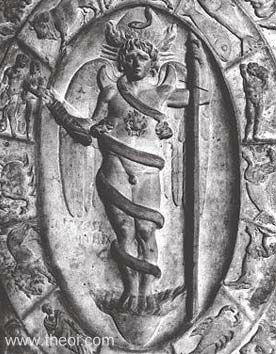 In the Orphic tradition in ancient Greece, a cosmic egg formed from darkness and primordial elements, and out of that egg was born the god Protogonos/Phanes, from whom all the other gods came. There are many, many other cultures that involve eggs in their creation myths, but this sampling shows the ancient and wide-spread linking of eggs and life. Because of the strong association between eggs and creation, it was only natural for cultures to include eggs in the holidays and festivals that marked the renewal of life on Earth. During the ancient Egyptian spring festival of Sham el Nessim, which is still celebrated today as a non-religious holiday throughout Egypt, one of the traditional foods prepared for picnics is hard-boiled, colored eggs. Supposedly, Egyptian pharaohs would hang dyed eggs in the temples as symbols of renewed life. The Persian festival of Nowruz, which translates to “new day,” is a New Year celebration that occurs on the spring equinox. It is mostly celebrated in countries where current residents have Persian roots, such as Afghanistan, Iran, Iraq and Azerbaijan. The holiday, though now secular, has its roots in Zoroastrianism and was celebrated by the people of the Achaemenid Empire. Many scholars believe that the extensive relief sculpture of a lavish procession on the walls of Apadana at Persepolis depict the celebration of Nowruz. Mary Boyce even asserts that the oval objects carried by the men carved on the Eastern staircase could be eggs! The modern Nowruz table, called the Haft-Seen, features colorful eggs to represent fertility and new life. Because of the pre-existing associations between eggs, spring, and the renewal of life, it is only natural that eggs became a symbol of resurrection during Easter. Some suggest that because people are not allowed to eat eggs during Lent, the eggs were boiled for preservation and then eaten on Easter- thus becoming a traditional Easter food. The original color for Easter eggs was red, to represent the blood of Christ, but over the years we have become much more elaborate with our decorations. The Ukrainian pysanky (which possibly have ancient origins) are quite complex and beautiful. And, of course, we can’t forget the bejeweled, opulent Fabergé Eggs. 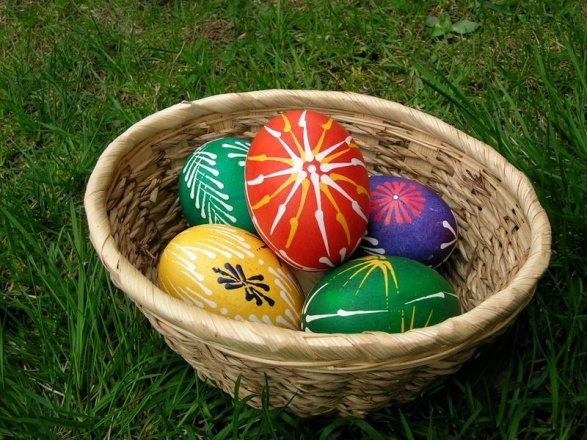 One of the most popular Easter egg traditions throughout Europe is the “egg tapping” contest. 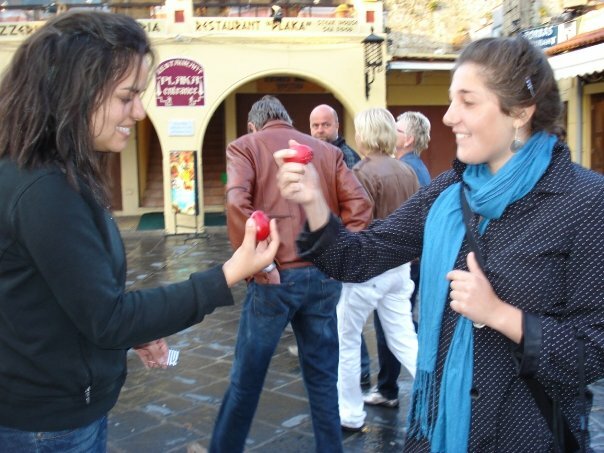 Each player hits another person’s egg with her own, and the last one left with an intact egg wins. The American tradition of Easter egg hunts comes from Austria and Germany. Egg rolling is popular in Western Europe, and was brought to the United States by European immigrants. Every Easter in the U.S., there is a huge egg roll on the White House lawn where thousands of children participate. Do eggs have a special significance in your culture? Do you have awesome egg decorating tips to share? Tell us in the comments! 2. David Adams Leeming, Creation Myths of the World: Volume 1 (ABC-CLIO, 2010), 145. 4. Ali Mousavi, Persepolis: Discovery and Afterlife of a World Wonder (Boston: De Gruyter, Walter, Inc., 2012), 52-53. 5. Mary Boyce, A History of Zoroastrianism : Volume II – Zoroastrianism under the Achaemenids (Leiden: Brill, 1982), 107. This entry was posted in Blog, Public Life, Religion and tagged ancient history, antiquity, AntiquityNOW, Easter, Spring. Bookmark the permalink.